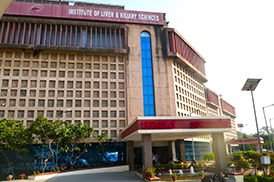 During the month of February, Dr. Achal Dhir held a visiting professorship position at The Institute of Liver and Biliary Sciences (ILBS), Delhi. 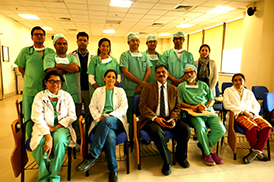 ILBS is a university, a state of the art tertiary care hospital and a leader in managing patients with liver diseases. 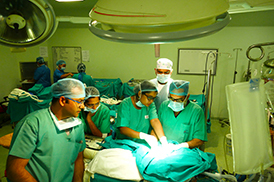 The anesthesia department at ILBS covers liver transplants, kidney transplants, major hepato-biliary surgery and other general surgery for both pediatric and adult populations. Apart from running clinical services, there is great emphasis on academics and research. Dr. Dhir taught multiple lectures and led many patient-based learning discussions. Some of these topics included severe Pulmonary hypertension, Severe Hepato-Pulmonary syndrome and, pediatric acute liver failure. 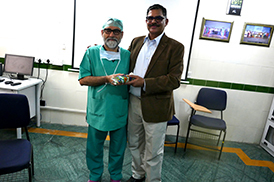 He also held hands-on sessions and live demonstrations of TEE during liver transplantation. He attended multidisciplinary rounds and visited other operating rooms and day-care procedures. Dr. Dhir also had the opportunity to visit the academic facility with the Dean of ILBS and saw the research, animal, genome, hepatic regenerative medicine and stem cell labs. Notably, Dr. Dhir was in attendance at the Institute’s convocation, presided by the Honourable Vice-President of India. Dr. Dhir was able to share the curriculum and learning objectives for liver fellowship and resident rotations from our department with ILBS. When he returns for his next visit in May, Dr. Dhir plans to continue this work and continue to lecture on TEE topics with hands-on trouble shooting exercises. Learn more about Dr. Dhir and his research.